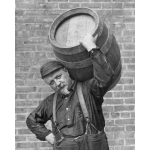 Check our series of slide shows that celebrate the wonderful world of beer aand brewery history in America. The architecture and machinery of a few great American breweries. The wagons, barrels and beer drivers that got beer to the masses. The Dark Days of Brewing -- thirteen years of National Prohibition. Images that capture the many simple joys of beer. publication featured 23 different turn-of-the-century brewery advertising lithographs. brief histories of the companies they advertised. ... Lithograph: Federal Brewing Co., Brooklyn, NY. ... Lithograph: Stroh Brewery Co., Detroit, MI. ... Lithograph: George Ringler & Co., New York, NY. ... Lithograph: Rieger & Gretz, Philadelphia, PA.
... Beer Truck: Wooden Shoe Beer, Minster, Ohio. ... Beer Truck: Arrow Beer, Baltimore, Maryland. ... Beer Truck: Student Prince, Covington, Kentucky. ... Beer Truck: Ebling's Extra, New York City. ... Beer Truck: Budweiser Beer, St. Louis, Missouri. ... Beer Truck: Fidelio Beer, New York City. ... Beer Truck: Franklin Brewery, Brooklyn, New York. ... Beer Truck: Standard Erin Brew, Cleveland, Ohio. ... Beer Truck: Labatt's Beer, Canada. ... Beer Truck: Miller High Life Beer, Milwaukee, Wisconsin. A collection of St. Louis brewery photos, 1890s. A collection of architect's drawings of breweries from 1904. ... Drawing: Bluefield Brewing Co., Bluefield, WV. ... Drawing: Dubuque Brewing & Malting Co., Dubuque, IA. ... Drawing: El Paso Brewing Association, El Paso, TX. ... Drawing: Forest City Brewing Co., Cleveland, OH. ... Drawing: Saltzmann Bros. Brewery, Oil City, PA.
... Drawing: Park Brewery, Winona, MN. ... Drawing: Fred Sehring Brewing Co., Joliet, IL. A series of photos of the Falstaff Brewing Corp., Plant #3, Omaha, Nebraska. ... Photo: Falstaff/Omaha, Exterior View 1. ... Photo: Falstaff/Omaha, Exterior View 2. ... Photo: Falstaff/Omaha, Constructing New Bottling Plant. ... Photo: Falstaff/Omaha, Aerial View of Brewery. ... Photo: Falstaff/Omaha, Constructing New Stockhouse. ... Photo: Falstaff/Omaha, Inside Brewery Office. ... Photo: Falstaff/Omaha, The Lauter Tank. ... Photo: Falstaff/Omaha, The Brew Kettle. ... Photo: Falstaff/Omaha, Inside a Beer Vat. ... Photo: Falstaff/Omaha, The Oak Fermenters. ... Photo: Falstaff/Omaha, Inside the Cellars. ... Photo: Falstaff/Omaha, Inside the Bottling Plant. ... Photo: Falstaff/Omaha, Inside the Packaging Plant. Pics from the G. Heileman Brewing Co., La Crosse, Wisconsin. Courtesy of Thomas O. Johnson. ... Photo: Coopers at the Heileman Brewery. ... Photo: Outside the Heileman Brewery offices. ... Photo: Workers at the Heileman Brewery. ... Billboard: Old Style Lager Beer. Breweries of Montana & Idaho. Courtesy of Steve Armstrong. Breweries of Spokane, Washington. Courtesy of Nick Johnson. ... Photo: Galland-Burke Brewing & Malting Co., Spokane, WA. ... Photo: New York Brewery, Spokane, WA. ... Photo: B. Schade Brewing Co., Spokane, WA. ... Photo: Golden Age Breweries, Inc., Spokane, WA. ... Photo: Bohemian Breweries, Inc., Spokane, WA. Photos of the DuBois Brewing Company, DuBois, PA. Courtesy of Mark's DuBois Beer Page. Western Pennsylvania Breweries. Courtesy of Rob Musson. ... Photo: New Philadelphia Brewing Co., New Philadelphia, Ohio. ... Photo: L. Schlather Brewing Co., Cleveland, Ohio. ... Photo: Jacob Halm Brewery, Bryan, Ohio. ... Photo: Jacob Kuebeler Brewing & Malting Co., Sandusky, Ohio. ... Photo: Anton Kopp Brewery, Millport, Ohio. ... Photo: Schuster Brewing Co., Massillon, Ohio. ... Photo: Kanawha Brewing Co., Charleston, West Virginia. ... Photo: A. Gettelman Brewing Co., Milwaukee, Wisconsin. ... Photo: Oconto Brewing Co., Oconto, Wisconsin. ... Photo: Dixie Brewing Co., New Orleans, Louisiana. ... Photo: D.G. Yuengling & Son, Pottsville, Pennsylvania. ... Photo: F. & M. Schaefer Brewing Co., Brooklyn, NY. ... Litho: Adolph Coors Brewery, Golden, Colorado.